Austin City Limits Live at The Moody Theater (ACL Live) is a state-of-the-art live music venue that hosts approximately 100 concerts a year and serves as the permanent home for the taping of the acclaimed KLRU-TV produced PBS series, Austin City Limits, the longest running music series in American television history. And one of the best things about ACL Live? Its state-of-the-art air conditioning! Come to ACL Live this summer to beat the Texas heat, and see an amazing array of music. 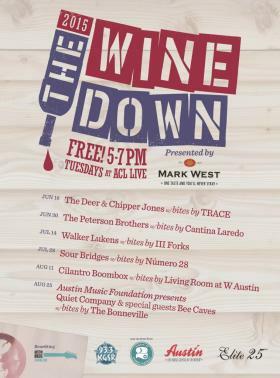 THE WINE DOWN is back! This FREE summer concert series, presented by MARK WEST WINES, has moved to Tuesday evenings from 5-7 p.m. The series remains indoors on the air-conditioned concert floor to cool down the hot summer evenings. Each evenings entertainment will once again be emceed by KGSR, and will host giveaways for merchandise from businesses around the 2ND Street District. All proceeds benefit the Austin Music Foundation.